Man United can be a Premier League title contender next season, according to the club's manager. Louis van Gaal expects Manchester United to take the fight to Chelsea next season and challenge for the Premier League title. Fourth-placed United trails the league leader by 15 points with four matches remaining after an inconsistent campaign that saw the club struggle early on. However, a record of four defeats in 24 has seen the side charge back up the table. A return to the UEFA Champions League looks on the cards if United can maintain its advantage over fifth-placed Liverpool - currently seven points - but Van Gaal has much higher ambitions for next season. "The board have given me three years for that objective [winning the league]," he said. "This year we have not challenged Chelsea but we are very close to second position. There is not a big gap, I don't think so. You can judge that when the clubs are playing matches against each other. Chelsea are far above the other clubs. Next year can be different. Next year we shall be better prepared. "I cannot deny that we need balance in our selection. 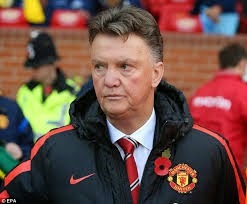 I think also the preparation of our season, I think that Manchester United has already adapted to a better preparation. We started very badly this year because when you cut the start of it, I think we equal Chelsea, for example. Now we have to start better, and then we have to perform at the moment it is being asked of." United faces West Brom at Old Trafford on Saturday with captain Wayne Rooney and Robin van Persie fit to play, however Michael Carrick continues to be absent with a calf injury.